Alpine Companies provide full-service concrete removal, excavation and replacement services, specializing in brick and flagstone inlay. 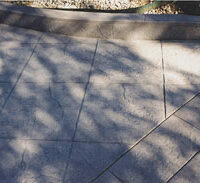 We also offer colored concrete, decorative cut control joints, acid stains, stamped concrete, and restoration. Your concrete around the outside of your home receives more abuse with the frost freeze cycles, chemicals and salt used for snow melt than anything on the exterior of your home. 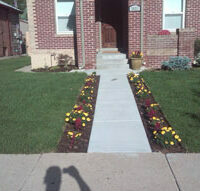 The Alpine Companies have been installing, replacing, and repairing concrete driveways for 3 generations in Denver. Jay Lesser with Alpine says they’ve literally done thousands of concrete driveways, patios, sidewalks, steps and house slabs and we’ll bring this experience to make sure your concrete is installed correctly. This includes attention to compaction of the soil under your driveway; precise placement of steel rebar in your driveway and all other concrete around your home. 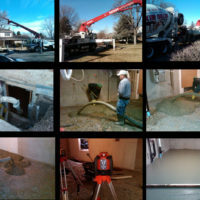 We always use at least 3000 psi concrete, and many times, 4000 psi concrete, to ensure your concrete stands up to the elements and chemicals in Denver. We have a whole division that does nothing but form and pour basement slabs and concrete slabs on grade. Our experienced superintendents have years of experience forming structural concrete floors and walls. We’ll work with your builder or architects plans and spec’s to make sure you get a perfect structural concrete slab that won’t need to be torn-out and replaced years later. 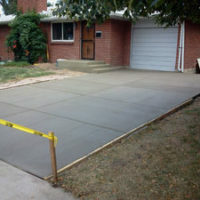 Concrete driveways are always a great choice in Denver. They hold up extremely well during our cold and unpredictable winters and they’re available in different colors and patterns. 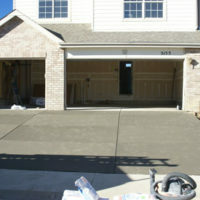 We’ll meet with you and offer suggestions about the concrete driveway that will work best for you. We will discuss where concrete curbs are called for, best thickness of the concrete for your type of usage as well as the amount of steel rebar needed. 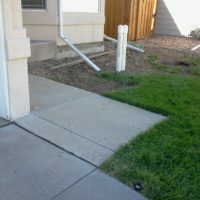 Our mudjacking division spends more time raising sidewalks that have sunken than any other area of concrete around homes in Denver. There’s no reason for sidewalks that are cracked and sunken where the concrete sidewalk meets the concrete steps at your front door if the concrete contractor that installed the concrete had put Z bars in the concrete. 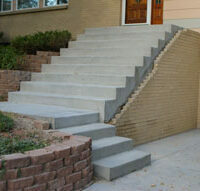 We’ll form and pour your concrete steps and concrete stairs with compliance to the building codes in Denver. We always use Z-Bars in your concrete steps to keep them from cracking and sinking in our expansive soils here in Denver. We perform expert repairs on concrete stairs, and we’ll always use a non-shrink grout, powerful concrete bonding-agents, and concrete sealers applied so the sealer lasts. Concrete curbs come in all shapes sizes and colors and are used for many different reasons now like retaining mulch and as tree rings. We can show you different shapes and sizes that will accomplish your landscaping goals. If you’re considering widening your existing driveway or adding a circular driveway to your home, you’ll need a curb cut and they’ll always and require a permit and inspection by an inspector in Denver. The city and County of Denver will want to have an inspector present when the concrete for the curb is placed and finished, and well take care of all of this for you. Concrete footings require special attention because of our frost freeze cycles and our expansive soils constantly moving concrete around. The building codes in Denver require inspections on all footings for new buildings, additions, and retaining walls. We’ll make sure your footings constructed by the Alpine Companies are structurally sound so you don’t have problems. Alpine Companies can create add a unique touch to your concrete project by adding color. 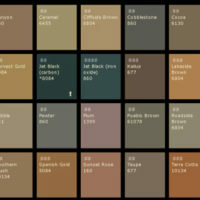 There are over 50 colors to choose from. CONTACT us today for all your Concrete & Concrete Repair needs! 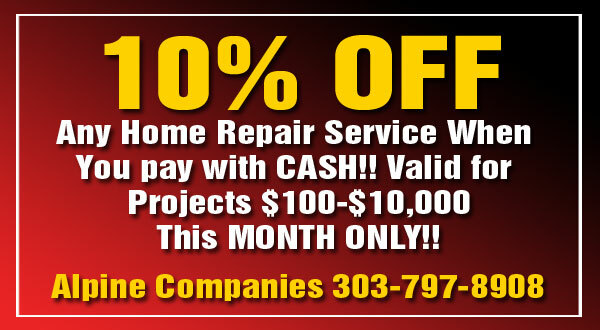 Alpine Companies guarantees the highest quality Concrete & Concrete Repair at the best possible price!